Look guys, I have friends! 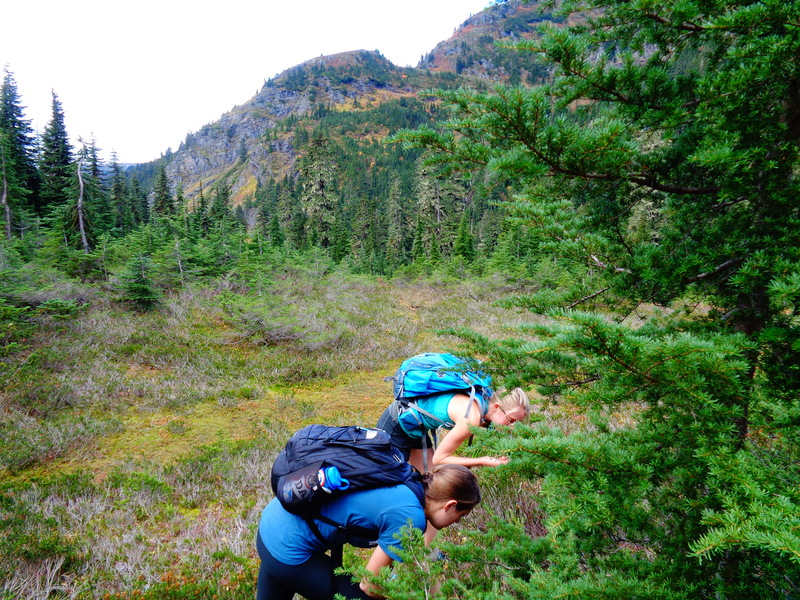 First blog post centered around a hike that actually involves other people. I’m way overdue (this was hiked 10/18/2014, over a week ago) but since I didn’t hike much last week I didn’t want to use up all of my content in two days. Did I Trip: No. Maybe uphill once. So I thought we’d be driving out Saturday, hiking out to a campsite, and camping somewhere beautiful, but I was wrong. We didn’t arrive until after dark, so we set up camp in a lovely parking lot (Bagley Lakes/Chain Lakes trailhead) next to an outhouse. How luxurious. We were near Picture Lake and had a great view of Shuksan at least, so that was nice. And we could make a bonfire without concern, which we did to cook dinner. The next morning, I woke up to the entire side of the tent glowing pink, and assuming there was a beautiful sunrise, I leapt out of my sleeping bag and ran out of the tent to see Shuksan lighting up in the sun. But classic northwest, it was just a weird hold in the clouds that lasted about 45 seconds before being covered up again. 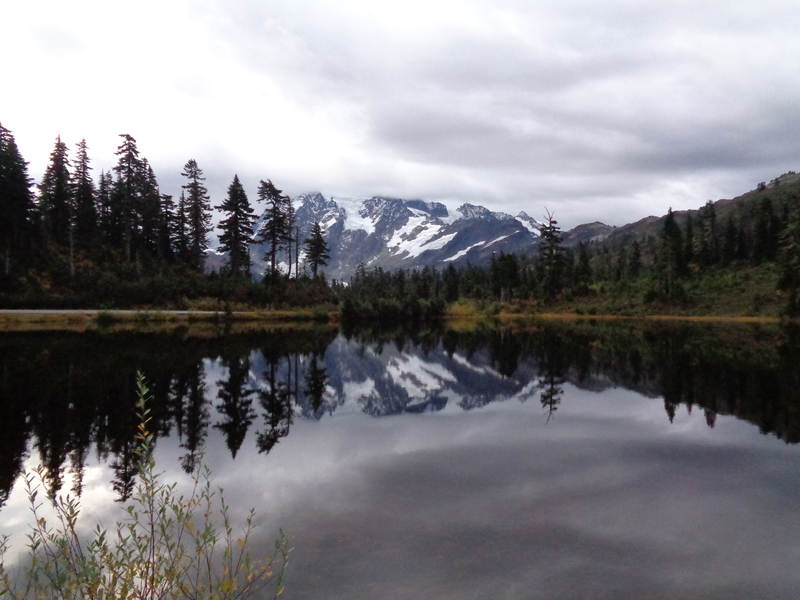 Shuksan was still looking majestic, but I have yet to see its peak. It was another half hour or so to the Yellow Aster trailhead, which had the worst outhouse I have ever seen. You could smell it from 50 feet away. Hold your breath past that, and the rest of the hike is gorgeous. It starts switchbacking up the meadow, then the woods, and as soon as you pop out of the woods, huckleberries everywhere! The biggest, sweetest juiciest huckleberries I have ever had in my life. I was surprised they were still there in October. The trail was open to hunting (we did meet a few hunters) but I saw nothing even resembling wildlife, and apparently the bears are missing out on the berries. Views of Shuksan were beautiful, even if we couldn’t see the peak through the clouds. Fall foliage was still everywhere, despite it being late October, and we lucked out because apparently the end of the road is already closed because of snow. From the top you could see Mt. Baker as well, and I imagine the views are insane on a clear day. The trail was well maintained, no tricky crossings or anything like that, and not too steep until the very end. The first summit is a false summit, and you have to hike down a bit and along a ridge to get to the real summit, which unfortunately my friends weren’t too keen on pursuing. One was wearing a t shirt and jeans (I don’t know how he wasn’t freezing), and it was freezing cold at the top with wind around 30mph (gusts up to 40mph) according to a few trip reports. I had on four jackets, one of which was windproof, thank god. Next time, when I go on a clear day, we’ll be getting across to the real summit. On the way back down, we had some patchy sun and more berries! I do think most of the trail would be runnable if you don’t mind heights and ridge lines, because it was pretty gradual and scenic besides that last push to the top.I’m actually not sure where we would have camped. I wasn’t looking very hard, but there weren’t any obvious sites, and we would have had to find somewhere out of the biting wind. There’s a lake on the other side of a pass that you can reach from the same trailhead, so that might have made for a good campsite and extra hike. I didn’t get as many pictures as I wanted to (friends are distracting, who knew) but at least I’ve got the most important pieces, which are berries and views. Mt. Shuksan got all of my attention (sorry Baker) because I’m dying to climb it next summer. I don’t know why it appeals to me over Baker. It’s pretty short (only 9131ft) but is supposed to be incredibly scenic. Looking back, I didn’t even get Baker in a panorama. It wasn’t as visible as Shuksan either, but again, on a clear day… I bet it’s amazing. Anyway, the sun came out for brief periods of time, but those damn blue patches never centered over Shuksan or Baker. Next time! 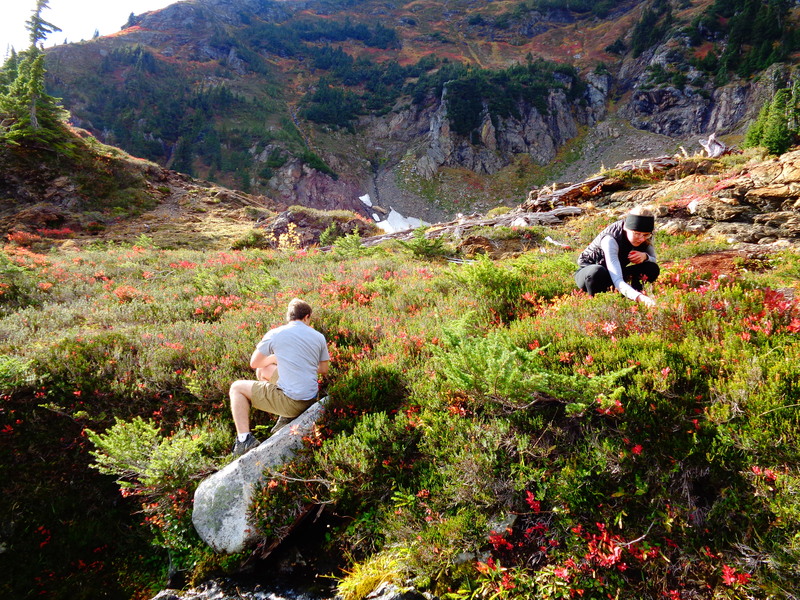 This entry was posted in Fall Foliage, Mount Baker Highway. Bookmark the permalink. The panorama shot is great. The one of the person with upraised arms woudl blow up when I clicked on it. Did you bring any huckleberries home with you? You can make wine with those things.